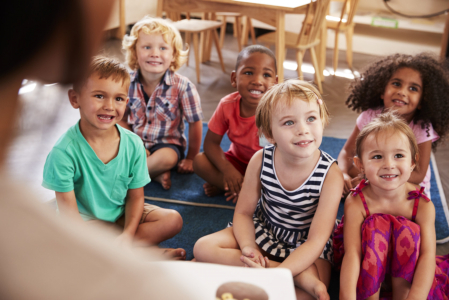 Going to daycare or preschool like universal pre k in New York is often the first time children will be away from their parents for an extended period of time. Because of this, your children may feel a bit of separation anxiety. A great way to avoid separation anxiety from being experienced by your children is to introduce to them the idea of early education, daycare, or preschool weeks or months in advance when possible. By introducing your children to the idea of early education in advance they may even become excited about their first day of early education. One great way to introduce the idea of going to school, like our preschool and daycare in Astoria, New York, to your children is by telling them stories of your own experiences during school. Your children look up to you and want to be just like their parents. By telling them stories about your time at school, they will likely be excited to be able to do what their parents had done when they were children. Start teaching them new words or ideas at home and let them know that they will learn more at school. Children love to explore and discover because, for them, everything is new. Pay visits to early education centers and preschools with your children. Ask your local daycare like our Astoria daycare in New York if you can schedule a tour. Visiting the school in advance is a great way to introduce your child and get them excited for the school environment. This is also a great way for parents to get an idea of what to expect for their children during their stay at daycare or preschool. This entry was posted in Early Education and tagged Child Care, Child Education, preschool. Bookmark the permalink.